Stalwart actor-filmmaker Kamal Haasan’s most eagerly awaited spy thriller, Vishwaroopam 2, is slated for release on August 10. 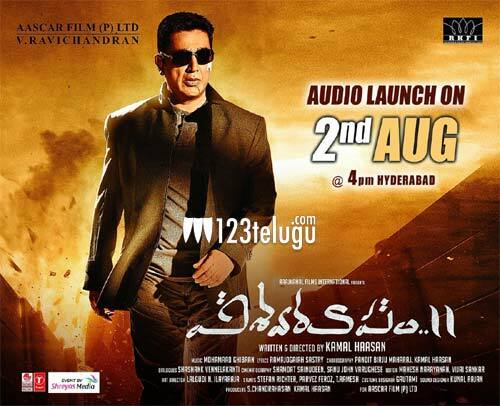 And the latest update reveals that the film’s Telugu version’s audio launch event will be held in Hyderabad tomorrow. Ghibran is the film’s music composer. Vishwaroopam 2 is a sequel to the blockbuster 2013 film on global terrorism, Vishwaroopam. This high-budget entertainer also stars Pooja Kumar, Andrea Jeremiah, Rahul Bose and Shekar Kapur essaying prominent roles. The film will have a simultaneous release in Tamil, Hindi and Telugu.